Hey man! Great stuff on all these Magnus updates! Noticed you had pricing questions, so I wasn’t sure if you hadn’t seen this when I posted it a while back (https://fbcdn-sphotos-c-a.akamaihd.net/hphotos-ak-ash3/1262981_585483854827269_1797173796_o.jpg). Feel free to repost it! Also, if you have the Walmart app you can use the barcode scanner to scan the Magnus code and it comes up as $14.97 and “Not available online at this time”. And the gun to the right of it… it is one of the new colored Vigilons! 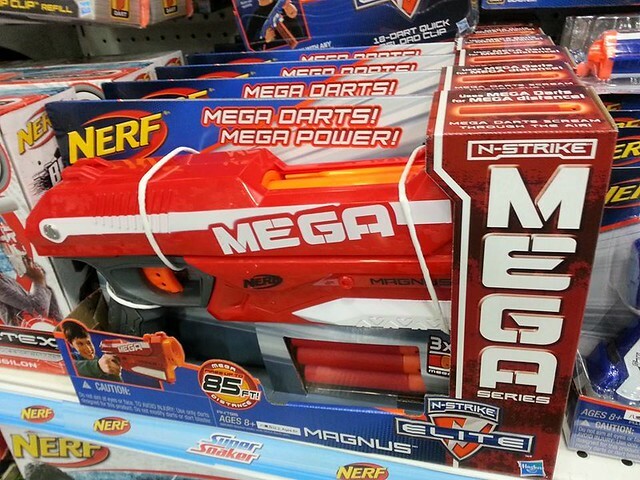 @Basic Nerf, on Nerf’s Facebook page, in a recent post, they stated the Magnus will be released 1/1/14. So, New Years will mark the release. The comment was made 11/5/13 in response to someone asking when the Magnus will be released. The model on the picture is quite young compared to the elite one. Perhaps the MEGA series is targeted towards a younger audience? Is it typical for blasters to leak this early? I like the design from what I can tell. The ironic thing is the Flip Clip pack in the top left corner.